▷ Best Blue Highlights 2019 ¡Photo ideas & step by step! 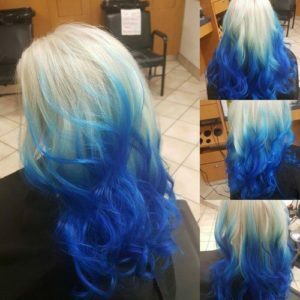 Blue highlights come in and out of trend really quickly, but, every day hair styles become more daring and fantastic, one of the most amazing and fun fashions that are conquering the styling are rainbow hair. This wonderful hair style combines the best of two worlds, the Californian and balayage highlights and the vibrant fantasy colors. But a particular color that has undoubtedly stolen the hearts of stylists and celebrities is blue in all its shades. 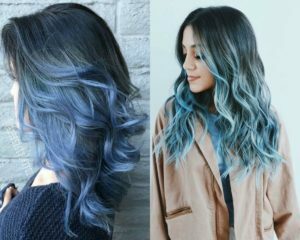 Blue highlights have caused a furor and remain a favorite of those who dare to wear them, giving the hair a style of a mermaid. Blue Highlights are one of the strongest trends in aesthetics and beauty. You can do them in any kind of hair, in blond, brown and black hair, they look great, the only condition is to dare to do them, because, you will need to work hard to maintain them pretty and bright. Blue Highlights fit well in all types of hair. Whether you have blond, brown or black hair you can wear this fantastic color. The process is very simple, the first thing is to submit your hair to the typical bleach of classic Californian highlights, my advice It´s that you shouldn´t do it yourself, because, you can burn your entire hair and cause a great damage, the recommendation is to go to a stylist to give your hair a professional touch, the perks of this, It´s you will be threaten like a queen for several hours. 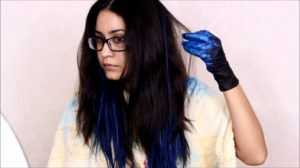 The bleached can be in block so that it goes directly from your natural color to the fantasy or gradient color, so that you progressively go from your hair color to an intense blue until you reach a washed blue. That will depend on how willing you are to discolor your hair and your personal taste. Once it is discolored it is time to apply the fantasy dye, it is important that you take into account which brand you are buying, make sure you acquire a good quality dye, if you do not know which one is the best for you, we recommend that you check with your stylist of confidence, with a distributor or a friend of yours who knows about different brands of dye. 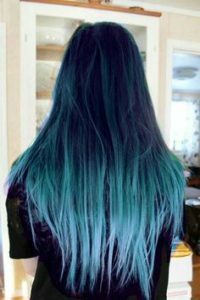 If the coloring process will be done by a professional, you do not have anything to worry about, so you can tell him which tone of blue you want to put in your hair. However, if you plan to do this process yourself, you should bear in mind that depending on the amount of dye you apply and the time you let it act on your hair, the color will vary. If you want a soft blue sky you should not exceed 20 minutes, while if you expect to achieve an intense dark blue tone it is best to let it act for about 45 minutes. 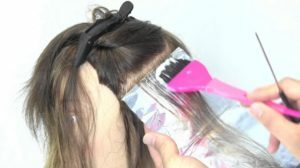 I insist, make a good research before you experiment with your hair, of course, If you have dye your hair several times, you will be a pro with this technique. 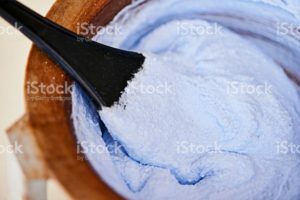 The blue color is one of the most difficult to handle if you are not an expert, it is not easy to penetrate into hair that is not well bleached, so the first step is extremely important for you to achieve your goal. 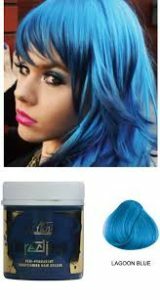 You may need to apply two or three processes to achieve the tone of blue with which you dream, but once you get that color will stay in your hair for a long time, dazzling everyone with your mermaid blue highlights. Although blue highlights have become an absolute trend in terms of color and dyeing, it is important to have in mind in order to achieve a good result, the hair must be decolorized a lot (if you are brunette or brown), until it reaches a very light blond tone. Don´t be nervous, this hair tone stands out and combines perfectly with different hair tones, so it does not matter if you are blonde or brunette, even, If you are tanned or not. The most important thing is that the blue color is well fixed. 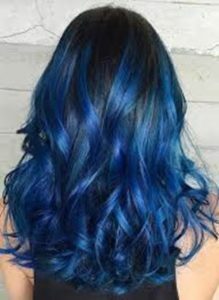 You have several options in terms of blue highlight coloration, following the trends you will be able to see and woman who have dye all their hair in blue, who choose a Californian Highlights or balayage, or some highlights from the root. What kind of Woman would wear it? Everyone, regardless of hair color or skin color, all girls can wear beautiful blue highlights; proof of this is that a lot of celebrities have dared to wear it. To prove it we have Kate Perry, Vanessa Hudgens, Demi Lovato and Kyle Jenner. They have all worn it in different ways, with short, long, light or dark hair, smooth or curly, showing that this style can be adapted to all types of hairstyles and each of them gave their own personality. They are tones that are so infrequent that they become a perfect opportunity to set trends. 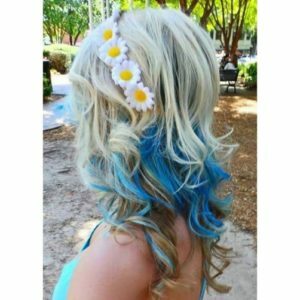 Of course, do not expect to go unnoticed if you choose a blue color for your hair, you will always end up attracting attention. If you want something subtle, but with a cool edge, then this is the look for you, this hair color will rock from the office to the party and have you looking totally fab for both occasions. 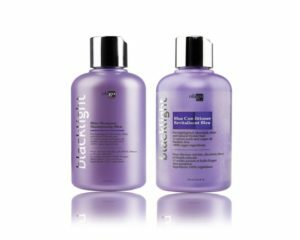 It transforms in different lighting, and the deep dark color leaves your hair with great depth and shine. 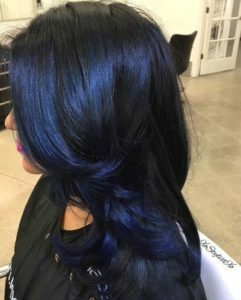 To achieve this look, search for a dark blue black color that will give a high gloss or if you hair is totally black, then, use it and give it a turn with this new look! If you like to make a statement with your hair, this is the one for you!. 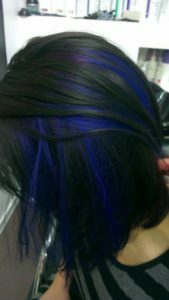 A full blue black hair dye will really make people do a double look and say “OMG, She is Fab!, I want to look like her!”. Hope this encourage you to play around with colors and see what works for your skin tone and style and be odd with this new life choice, because, people can notice who you are for how you thread and also how you wear your hair. Lighter skin often works better using more of a purple blue, whereas darker, more olive complexions can take a deep cooler blue. 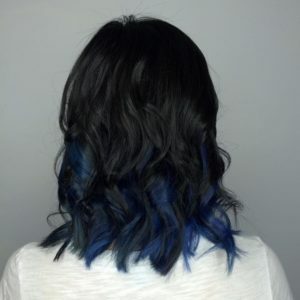 This all-over color works best on cropped styles for a really vivid color pop to lift your look, you can wear it with short hair to give it volume or long hair to give it live to it, because the glow this blue highlights made on Black Hair is wonderful. 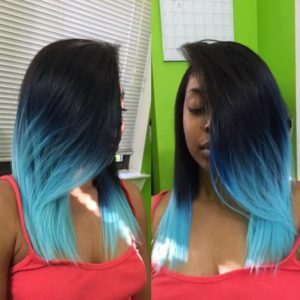 Black hair with blue highlights can make a huge difference, depending of what shade of blue you choose, how you prefer to distribute your highlights and whether you wish to use a lot of them or just give light to your hair. 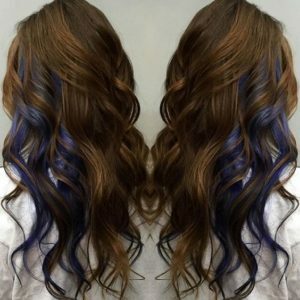 This look is modern, age-appropriate and acceptable in any setting, but, if you are shy and subtle, with dark blue highlights your hair will look shiny and with bunch of life. 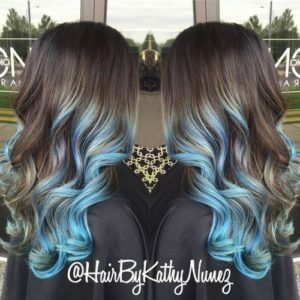 Light brown hair with pastel blue highlights and black roots is not a very common coloristic solution for girls who want a customized hairstyle. The subtle, barely-there blue looks more romantic than funky. This look gives an “effortless” style and It´s perfect for Boho Chic Girls and can easily be applied to the magic that happens when a woman wears a wavy Bob. And when this bob is light blue like the ocean water, we get a dreamy hairstyle that any young girl can have, as long as she thinks she can take advantage of it. Brunettes immensely benefited from the dark roots hair trend, so, don´t be afraid of taking an extremely care with it. With this trend, every single girl with dark brown hair can wear blonde and pastel shades much longer without frequent root touch ups and long hangouts at the hair salon. Light blue shades pairs well with ash blonde, gold blonde and light blonde and this color idea are no longer for blondes. I will take this highlights in mind to rock the music festivals coming soon, because, It will give you that messy alternative vibe that you totally want for your instagram post! 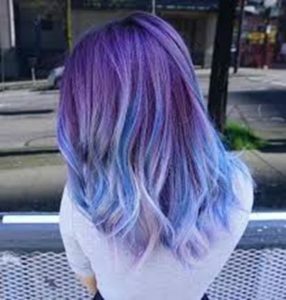 This trend grew up thanks to Tumblr and the grunge style between young ladies, but, let me tell you, this is not for any girl, because you will have to bleach your entire hair and then dye it in purple and the Highlights, this kind of look I called it “Rainbow Style”, because, It gives you that girly feeling. Sadly, this hairstyle will steel a lot of your time at your favorite saloon and a lot of money for roots maintenance, if you are studying and your budget is low or you work and study, please, don´t kill your vibe this way and be a little subtle with your hair style if you run a fast life. This fabulous color combination of black, silver and blue blends the hues of a dark and stormy night like the painting of Vincent Van Gogh called “Starry Night”. 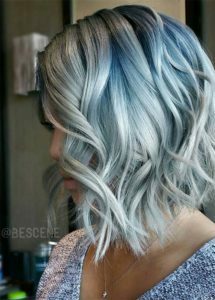 The blue highlights are peeking from under the gorgeous silver highlights, and the dark roots thrown into the mix of two lighter shades of grey and your natural roots if you have dark brown hair or black hair. If you’ve always wanted to get your little girl fantasy and turn into a mermaid, then this is the perfect hairstyle for you. 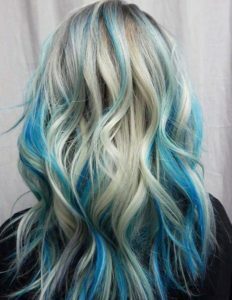 The long, curled blonde hair is accentuated with the bright blue highlights. 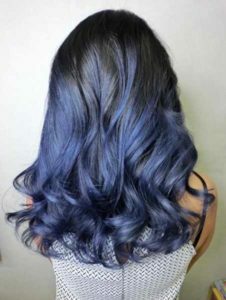 When you can’t decide on which shade of blue you like the most, you should incorporate a few of them into your new hair color. 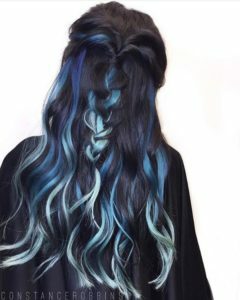 This colorful style is really feminine and chic with really long wavy curls and various blue tones. This step is very important, if you really want your hair to look perfect like a celebrity; you should not forget to keep it in time. The positive thing about using blue highlights as fantasy tone is that although it is a little complicated to penetrate the hair, once it does it will stay for a long time, so you will not have to touch up your hair all the time. With a touch-up every three or four weeks will suffice, and it may not even be a frequent process if you take good care of the color and do not wash your hair so much. Choose one or the other will depend on your tastes. Personally, I would always opt for a Californian highlights, since the maintenance of this dye is also expensive for the hair and if it is much damaged you can always make a change of look or a cut. If you prefer a full color or dye from the root, once you start to lose the tone you can make a color bath or tone the color. Remember that using products for bleached or painted hair is the best way to keep your hair healthy, the chemicals present in these versions will take care of your hair and close the open pores, eliminating the strands and ensuring the permanence of the color. To take care of your hair, apply masks, cream baths and moisturizing oils a couple of times a week, so that your hair looks silky and does not lose its shine. The funny thing about this mermaid style it´s that you should be careful with pools, pool chemicals will damage your hair work, so, try to avoid it the first days to have fun with them for a little while, however, you can go to the beach, but remember to take care of him after that, long periods of exposure to the sun will dehydrate your hair, so, he will need a little love from you. Having a mermaid hair may not be an easy task, but the beauty of the style is worth it. If you liked this article please share with your family and girlfriends to give them ideas to change their looks, you will give them a big favor. Thanks for reading and don’t forget to keep reading our articles.